With the wisdom of our “Anything but Delta” rule confirmed on our trip down to Sarasota, Dave and I sat at JetBlue’s Gate B5 waiting to board Flight 432 for our return to LaGuardia. Throughout the early part of the day, as we’d sat on floury white sand and then relished fried oysters, grouper fingers, salad, and margaritas at the Daiquiri Deck on Lido Key, Dave had followed our flight’s status, so we knew it was running late. Because of high winds and winter weather in New York, it was delayed two hours, so we’d taken our time before turning in Dave’s beloved black Mustang convertible and checking in at the airport. Having pointedly left at least one empty seat between themselves and others, those we assumed would be our future fellow passengers sat in rigid green vinyl seats around us. A sturdy woman with bushy hair and glasses. A tall, artsy, dark-haired man in a “Tillamook” emblazoned black tee-shirt and navy sportcoat. A girl, about thirty I'd guess, in a crotcheted yellow sweater. A slender brunette with stylish shoulder-length hair and smoky-blue glass hoop earrings. Her companion, a balding man in a cream colored linen suit. A portly gent in a checked cotton shirt, his eyes sparkly, his hair, crewcut. But for the guy in the black Tillamook tee-shirt who was riveted by his book, most stared at their phones, thumbs flipping on screens as they scrolled. Little eye contact. Few smiles. Everyone biding time. Right on time, or on time for the most recently posted delayed time, flight 432 pulled up to the jetbridge. At the counter, two airline representatives busied themselves at their monitors. One was a handsome guy with tousled brown hair and the sleeve of his white oxford shirt pinned closed at the shoulder. The other, a fortyish woman with short blond hair, wore a trim navy uniform and scarf. Standard stuff. We were an obedient crowd, and there was a general flurry as we rooted around in bags and backpacks for water bottles, snacks, and magazines. While we stood and stretched and looked around for our belongings, well-bundled passengers with wide smiles and expectant eyes trickled into the terminal as the plane from New York emptied and vacations commenced. I trotted off to the restroom, hoping to time it just right: late enough to hold me well into the flight and early enough to avoid last-minute anxiety. While perched on tiptoes in my stall, a gold necklace spilled onto the floor by my feet. “Is this yours?” I asked my unseen fellow percher as I held the necklace in my hand where she could see it beneath the dividing wall between us. As I returned to Dave, I smiled at the thought of this little exchange. That good feeling was to pass shortly. But for the roll of a few eyes, most people settled back into their seats. Two, a snappy woman with flowing black hair and the portly guy with the crewcut, grabbed their belongings and headed up to the counter to begin negotiations. Another JetBlue employee, Greta, a slender blond, had joined Matt and Kris. Was this a good sign or bad? Dave texted our friend Len whom we’d just visited in Sarasota. I took a few notes, then called my mom for a chat. Good. That’s what I wanted to hear. The thought of shuffling flights and finding a place to stay held no appeal. I wanted to hunker down at B5 and fly out whenever. Bushy Hair and I chatted. Her father had lived in Sarasota and passed away recently. She’d made this trip many times. I expressed my sympathies and showed her a video of my chuckling grandson. What could be more comforting? I heard Dave laugh and glanced toward the line to see him wide-eyed, hands gesturing, as he told a story to an appreciative, smiling circle, among them the woman with the smoky-blue earrings and her balding companion. The girl in the yellow sweater, too, nodded and rocked from foot to foot, her brunette hair bobbing in a loose knot on top of her head. Along the line, pockets had formed with small groups of cheerful chatter. Periodically the squawk of a bike horn, the burble of bubbles, the soft trill of a whistle, or a fifties ring tone erupted as cell phones signaled calls from friends and family checking on our progress. The guy in the Tillamook tee-shirt had joined the line, but never looked up from his book. What the hell was he reading? “Can you watch my bags?” I asked Bushy Hair. Heaven forbid I leave them unattended. I joined Dave and his group in their discussion of open space and agriculture. The “where are you from?” game had already been played, and Easton’s abundance of natural resources was under discussion. Filtering from the glass gates that led into the main terminal, the swelling crescendo of an aria momentarily stilled the babble. Opera at the airport? “I’m going to check it out,” I said and fell into step with the sparkly-eyed crewcut guy as we marched toward the glass doors. “So, you’re all set on a new flight?” I asked. “My god, yes! They’d never forgive you!” I crowed as he disappeared through the glass doors. By that time, the opera singer had silenced, so I returned to the line at B5 and sparked hoots of laughter in reporting the gastroenterologist’s mission. Meanwhile, the cleaning crew had arrived pushing heavy carts laden with buckets and squeegees. Garbed in spotless white uniforms with American flags embossed on the sleeves, the workers taped yellow strips that read “Restroom Closed” across the bathroom doors. I was not the only one to slip defiantly under those strips. By this time, the mood in the line was buoyant. People were exchanging business cards and saying, “It was so good to meet you,” as if we’d be departing soon. Kris, Greta, and one-armed Matt smiled vaguely when someone commented that we’d all go to their homes and sleep on pull-out couches. Yes, there were groans and more frenzied thumb calisthenics as folks scrolled and texted and phoned, but no one seemed angry; no one complained. I was hungry, and the restaurants and snack bars around us had closed. Luckily, Dave and I had brought provisions: Wheat Thins, almonds, and - bless the Lord – Thin Mints Girl Scout cookies. I was Miss Popularity, Miss Gate B5, as I walked the line offering those good-cheer-sustaining snacks. Even those who initially turned me down weakened at the whiff of those Thin Mints when I waved the box - too tempting! - under their noses. Up at the counter, Kris was calm, her face alight in the glow of her screen as she took information from whomever was next in line. Greta and Matt whispered heatedly and then turned to Kris. She took a deep breath, smiled at Greta, and said, “Go.” What was happening? Matt led Greta to one of the green vinyl seats and told her to sit. He disappeared briefly and returned with a wheel chair. Her bearing shaky, Greta maneuvered herself into the wheel chair with Matt’s help, and they started toward the glass doors. There was quiet for a moment, then someone yelled, “You’ve been great, Kris!” Another voice chimed in, “You too, Greta and Matt!” And we all burst into applause. The sun had cooled, veiled by haze, so I decided to go to the pool instead of the beach. Dave was snoozing, his tan skin striking in contrast to the white sheets and pillow. I scrawled a note on a paper napkin, placed it on the floor, and anchored it with a round black bottle of Captain Morgan’s Cannon Blast Rum. He was sure to see it. It was good to be on vacation. 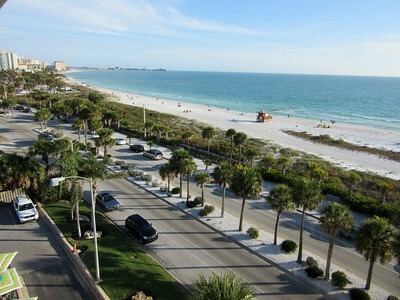 I descended the echoing cinder block fire stairs of the Holiday Inn on Lido Key, and pushed open the heavy metal door. Vaguely improved by a few listless palms and surrounded by cement knee walls that block the wind, the pool area is not our first choice, but a possibility on chillier days. Swathed in yellow towels, my fellow vacationers, slick with sunscreen and squinting at phones, reclined on blue lounge chairs lined up against the wall. A cluster of men in Hawaiian shirts sat on stools at the bar. A little girl, sun-toasted and grinning, flipped her long braid over one shoulder and dove into the pool. I glanced over the wall and across the boulevard to the beach with its white sand, soft as flour. A smattering of sea birds, white bellied and gray of wing, with funky spiked crests and stoic expressions, faced into the wind and tried to ignore the children who ran among them with shrieks and flailing arms. The green Gulf waters rolled and splashed frothy milk along the shore. Chilly or not, having considered my options, I opened the gate, waited for a car to pass, and crossed the road. Jim was stretched out on a lounger under a red umbrella by his rentals stand, peeling a banana. “All right! Stocking up on potassium, I see!” I said. This was a topic of conversation continued from yesterday when Jim experienced a sinking spell. He’d chugged one of his power drinks and wound up feeling woozy; so woozy it had been hard to lug umbrellas and loungers down the sand for those wishing to rent them. Dave had filled in for a time to allow Jim a breather. Jim is fifty-seven and his enthusiasm for the gym is apparent in his ruddy-skinned, well-muscled body. He stands and walks as if lifting a barbell, with a heavy gait, massive shoulders bowed forward, and his arms slightly curved. He speaks with the twang of his home state of Alabama and his broad, ready smile reveals prominent teeth. “How’s your day been?” I went on, referring more to his health than events. We walked toward the empty lounger together and he picked up one end, preparing to drag it back to his stand. The haze had lifted and the sun shone, delightful with late-afternoon warmth. "There they are,” he whispered. I turned to follow his gaze, but between the distance, my near-sightedness, and the tint of my sunglasses, I couldn’t see the couple well. They looked to be about forty, moderate build, pale. First day of vacation maybe. Hadn’t relaxed enough to be polite. They gathered up their yellow Holiday Inn towels and headed across the beach toward the hotel. “I get it that people get frustrated. Hell. I get frustrated too.” He chattered on, digging way back for examples at school, work, and with women, his gaze flickering periodically over my shoulder. “And we’re having this nice chat while they’re stuck with their poison,” I said. “Thanks for stayin'. Helped to talk this out… to get it out.” He inhaled deeply through his nose, blew a stream of air through loose lips, and leaned forward to drag the chair across the sand, leaving two narrow tracks in his wake as he trudged away. Who came up with that “Sticks and stones” ditty? Maybe some kid in a show of playground bravado, but in life, it’s not true; words have power... for good or ill. Jim’s a big guy. He’s been around. But he was hurt by that exchange. For all their ease in reducing travel time, flights are fraught with complications. Forget check-in, pat-downs, shoes and bracelets in bins, oversized roll-aboards, and people clogging aisles. Cups alone can hold a plane on the tarmac. Dave and I were on our way to Sarasota. In the interest of thrift and in order to get a full day on the beach, we’d bypassed our “ABD” (Anything but Delta) rule, and were scheduled to depart at 7:00 AM on Delta’s flight #3330. We opted to avoid a groggy middle-of-the-night drive by staying at the convenient and homey LaGuardia Inn, with its quick morning shuttle to the airport at 5:00. While waiting for Dave in the security line – clearly his profile is that of a terrorist for he is always pulled aside for a thorough inspection – I noticed a pilot, who turned out to be ours. He was tall, angular, and pale, a Benedict Cumberbatch twin, with an Asberger’s-like absorption as he strode past me in visored cap and uniform. When we boarded the plane, having turned over our rolling bags as the overhead bins were reported as full, I spotted him in the cockpit. A blond female attendant in flight-risky three-inch heels, stood in the hatch, hand on hip as if posing for a photograph, chatting with the Cumberbatch look-alike. Once all passengers were seated, bags stowed, Kindles and books on knees, the pilot’s voice – a flat voice, even-toned, perfect for him – came over the loudspeaker to announce our departure in five minutes. Cups! A fully-loaded plane grounded to wait for cups! I heard no grousing. No doubt everyone was yearning for morning coffee and those cups were crucial for that. Several people, myself among them, seized the opportunity for another trip to the restroom. Others, Dave among them, mimed Oliver Twist, holding out their hands plaintively, cupped, if you will. Luckily, most were not in a rush, but imagine explaining to your boss that you were late for a meeting because you’d been detained by a wait for cups! “I feel like yelling, just throw them!” hissed the attendant as she marched past us and down the aisle. Once the cups arrived, we prepared for take-off. We were snug in our cramped seats, so very snug, cupped, as it were, tight as eggs in their shells, in that delightful Delta airbus way. The head of the young man in 15A, the seat ahead of me, was cradled tenderly in my lap since he’d reclined his seat as far as it would go. Happily, his hair was clean, and wisps blew and bobbed in the well-conditioned air. Dave’s knees were spread wide, to accommodate the seat in front of him. But no matter. With Cumberbatch at the helm and cups in hand, we were off to palm trees, sunshine, rum drinks, and friends.